A few days ago, I was lucky enough to have one of the non-wetsuit places in the Thames marathon swim – a 14km swim from Henley to Marlow with a few locks to get around, which entails getting out the water, walking a few hundred metres and then getting back in. 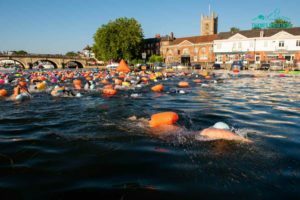 It’s an event that has been around for a number of years now and, as such, it is a great swim to do. 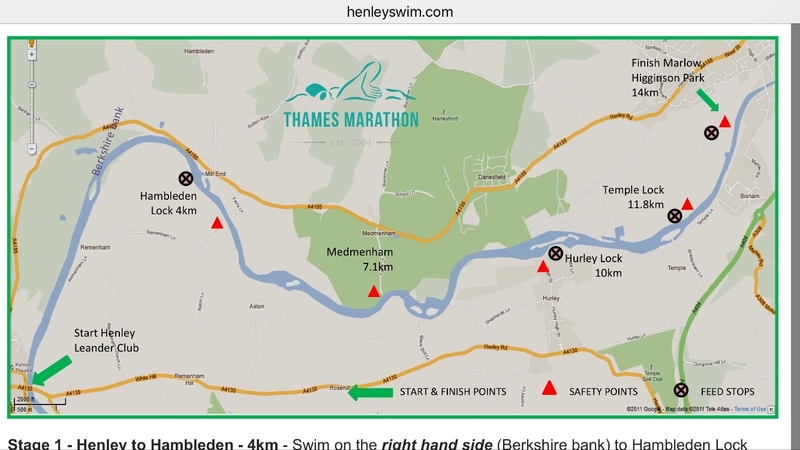 Well organised, well supported by a team of willing volunteers taking place in a wonderful part of the Thames. 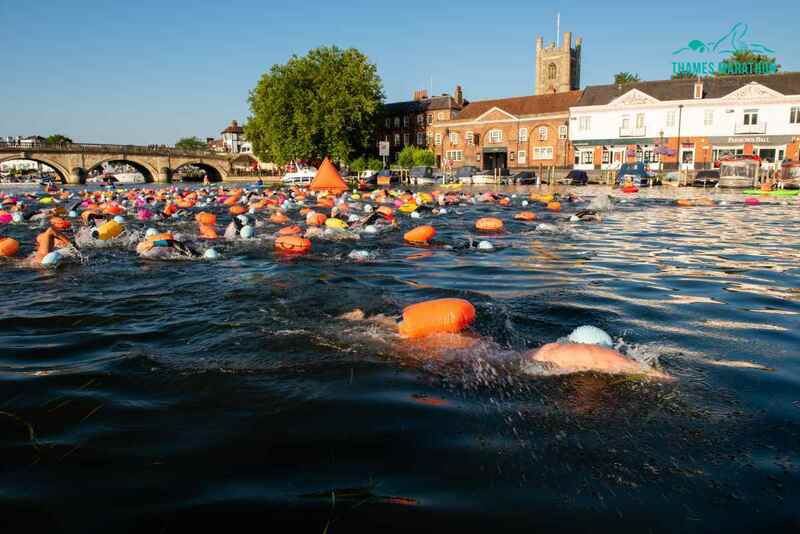 Be warned it is an early start if you are planning to travel there on the day but the swim is well worth the effort and from the moment you arrive, the organisation, check in and briefings are well run. The meeting point is the Leander Rowing club in Henley, just across the bridge from the Angel Pub where another of their swims, the club to pub ends. If you have the time, it is well worth arriving on the Saturday and spending the day and evening exploring Henley. It is a beautiful town with lots to keep you entertained. So for anyone who wants a really awesome longer distance challenge, this has to be one for your diary next season. But be warned, if you are specifically looking for a non-wetsuit place in the event you better be quick as they are generally the ones that go first. Now for the Hippo rundown. An early start saw the Slimhippo, Zimhippo and Harryhippo leaving the house at 4am. It was a superb day with just a few puffs of cloud in the sky and the temperatures were rising fast. On our journey there, we were greeted with a stunning sunrise. After parking the car we walked 10 minutes to the Leander club to register and check in. This year, the Slimhippo planned to walk the whole route. For a spectator, this is possible and a very worthwhile, picturesque walk. At registration, I was informed that, for the first time, I was not put in the fast wave; I had been placed in the second wave. I was slightly annoyed at the time but in hindsight, it turned out well and gave me an interesting perspective of the swim. Just before 7am, the speed wave hopped into the river ready for their start. I understand from other friends that the start this year was particularly physical, with everyone vying for position at the front – with the jetties jutting out into the river about 80m after the start, this created a pinch point for the start so as the swimmers set off, there was quite a bit of contact – resulting in a few black eyes and dislodged goggles. You sort of come to expect this from the fast wave as you have a group of very competitive swimmers in there with a good mixture of bioprene and neoprene. When I start in these waves, I tend to stick way out to the side to avoid the inevitable scrum. Your eyes do not deceive, That is a hippo leading from the start!! 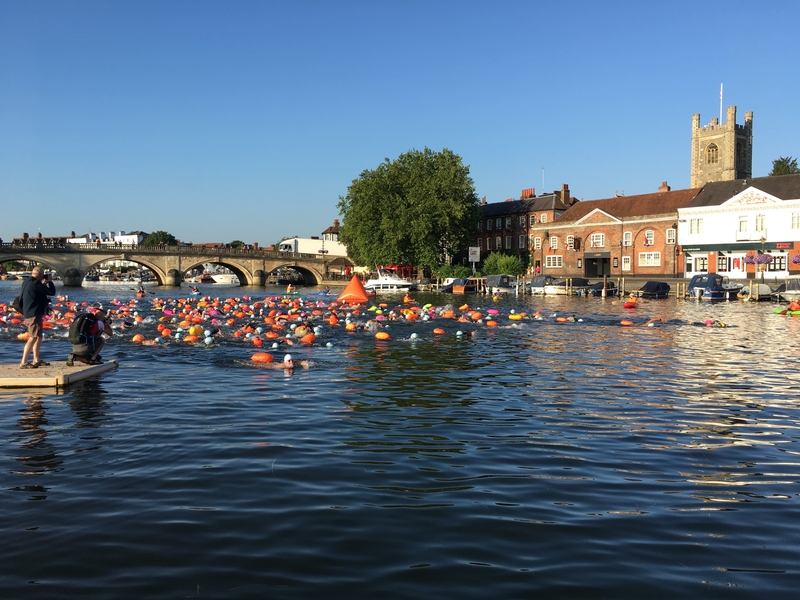 As the first wave meandered down the river, the 2nd wave got ready for their briefing, sunscreen – check, Vaseline – check, goggles –check, timing chip – check. All systems go. Soon it was time to enter the water. This was the wave I was in and as is normal for me I stuck well to the outside of the group, not wanting to get involved in the madness that often ensues in the centre. Then, we were off. To my surprise and the surprise of quite a few spectators, I led the group of 261 swimmers down the river. Now this is where the great part came. I had no one around me; I was out on my own with completely clear water ahead of me so my focus was not on trying to survive the start and get a good position in the river but could be focused entirely on my stroke and how efficiently I was moving through the water. With the opportunity to focus on my stroke and NOTHING else, I was moving pretty well through the water. The one minor downside was, as I was in the lead – not a position I often find myself in – I was having to sight more often than I usually do. I say this as a negative as sighting lifts my head, arches my back, pulls on my core which in turn affects my groin. This usually happens much later in a swim for me. That said, it was wonderful to swim on my own at a pace that I could dictate, rather than fight to maintain position. 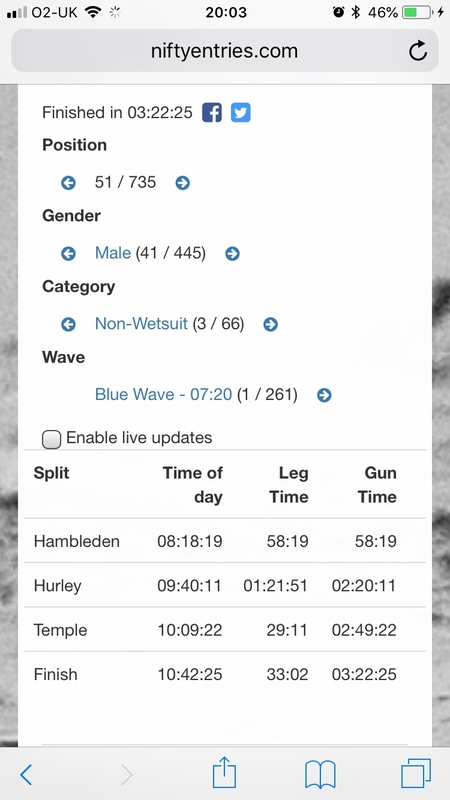 For the first 3.5km I extended my lead over the wave and came up to the tail enders of the wave ahead of me. 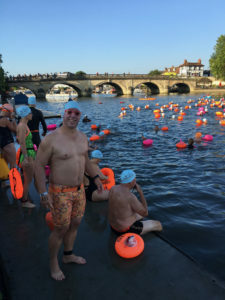 So, by the time I reached the first lock, I had passed a few pink caps and there was more surprise when I exited, firstly that the 1st blue cap (the wave I was in) had arrived so quickly and secondly that it was a bioprene swimmer. I did explain to them that I had been put in the wrong wave, but I must say, it was a great feeling. After passing the lock, I got back in and ahead of me was a lot of pink caps (1st wave swimmers). This is where my strategy changed tack entirely; not being in clear water and having about 200 swimmers ahead of me, the challenge – and my focus changed. 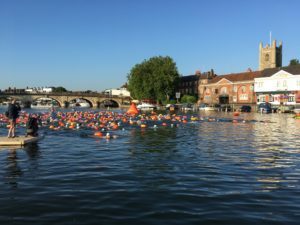 Instead of having the luxury of a very clean start and 4km of clear water with just me, my mind, my stroke and the river to focus on, I began focusing on reeling in and overtaking the swimmers in front of me. For some, this is one of the main reasons to race an event but for me, it is more of a hinderance. By focusing on people ahead and around me, I lost the focus needed to maximise my efficiency in the water. 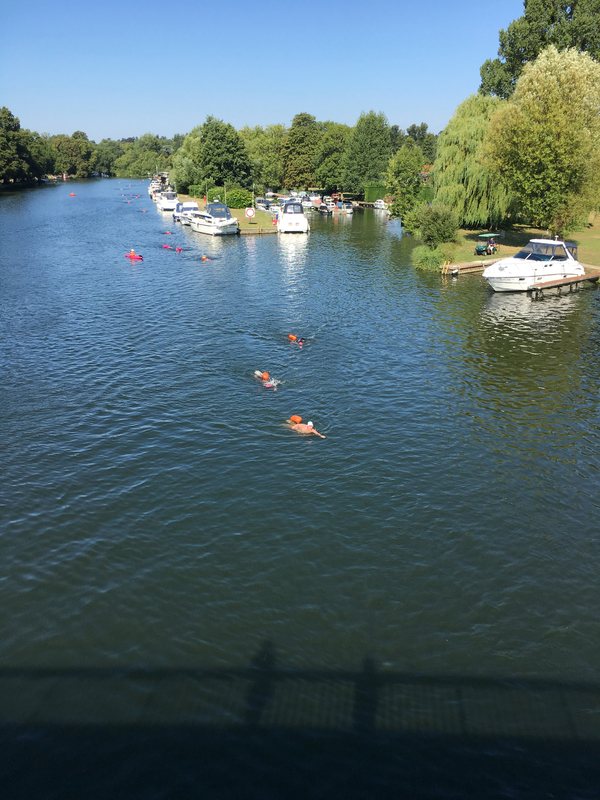 I have no way of telling whether I actually slowed down at all but my stroke definitely felt more laboured and gone was the smoothness that I desire out of my swimming. Lifting my head to often to sight, looking around, so as not to bump into swimmers, putting more power into a stroke, plus many other minute changes to my stroke made it seemingly inefficient. One thing I have learnt over my past swims, simply speeding up your arms and expending more energy is not going to make you go any faster. Slowing down your stroke and maximising power below the water is what really makes the difference. There are obviously exceptions to this rule, like sprinting, but in long distance I feel that slowing down my stroke, adding power and FOCUSING on my stroke is what makes the difference in my speed. The more things I have going on around me, the more inefficient my stroke becomes. Even though my stroke felt horrible, I was still passing the pink hats and at the 10km mark, where we were stopped by the kayakers briefly to let a barge go past, we negotiated our way around another lock. There were more surprised people to see a blue hat that far up the ranks. I again mentioned that they had mixed up the waves. Back in again for the last 4km. Still cruising along very well but not 100% happy with my stroke, I was really trying to just swim my own swim rather than catching people. This stretch was only 1.8km so went past in the blink of an eye. We were then out again to negotiate the last 2,2km to the finish. Got out, had a brief catch-up with some friends who were volunteering at the feed stations then it was back in to get to the finish. As it was only 2.2km and I felt absolutely fine, I decided to really push it to work my way further through the pink hats. As I was not suffering at all from aches and pains I tried to really push it. Seemingly, this hippo only has one speed. It is the one thing I have always wondered about. 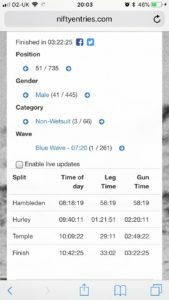 How is it, I can race a sprint, get my heart rate way up, and at the end of 100m I am completely spent and often have to lie down before I am functional again, and even that can take a while, On the flip side, I can get into a 10, 20, 30km swim and purposefully start out at what I would consider a cruising speed but as it is a LONG swim, I really have to make myself slow down. Then, as I do in training, I constantly try to get faster the farther I go. Finally, when I get out, I am absolutely fine; aches and pains that I would expect are not there. I cannot say I have ever really exited a long or ultra-distance swim and felt the same sheer exhaustion and fatigue that I do when I swim short distances in the pool at race pace. More Questions less answers. Go Figure! Is my pacing way off? I constantly believe that going out slow is the way to go but maybe not? Can I do better If I do push myself? – Which I tried to in the latter part of the race, where my stroke felt terrible. Am I pushing hard enough? It seems the harder I push, the worse my stroke gets. 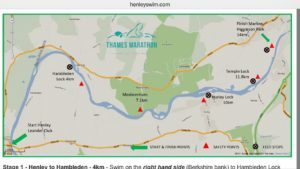 The worry I have is my races are generally quite long so if I really push hard in the beginning, will I just bomb out somewhere in the middle or at the end of the swim? I do not know the answers but what I do know, is when I try and push myself in these events under the circumstances experienced in the latter parts of the race, my feeling is that my stroke goes out the window and instead of being super-efficient, I become more like a fish out of water, just flapping around and going nowhere. Maybe it is something to do with the types of events I partake in or the intricacies of a very relaxed stroke in the bigger open water events. In all my 15 – 24km swims this year so far, I have come out of them absolutely fine with virtually no adverse effects bar a little tightness round my shoulders. A total contrast to racing 200-400m events where I feel the need for a defribillator at the end to resuscitate me. 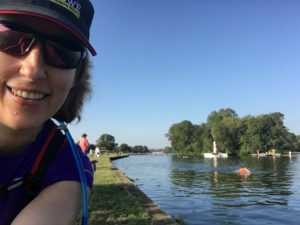 One thing that was very noticeable on this swim was that when I am on my own, swimming my own race, focusing entirely on my body, mind and stroke, without having to chase something or someone, it all works and seemingly I feel extremely comfortable, maybe too comfortable. So you see, the longer I do this sport and the more experience I gain, I have less answers and more questions as to this amazing sport that both challenges me and rewards me in so many ways. On a final note, In this year’s event, I only walked away with 11 bites on my body, I wear them with pride but am thankful that is was not in the 60s like last year. With the summer moving on pretty swiftly, I can say that I have had a great year finishing in a podium position on all my swims so far. Throw in the rigours of life – particularly the last 8 weeks, I am just amazed that I am still able to achieve what I have this year. So with no more big swims before my ultimate journeys end – for this year, I will be packing, moving house, buying a house and taking it easy before a final 38.6km swim in Loch Lomond in three weeks’ time. All of this has only been achievable due to the support of many, but in particular the Slimhippo, who has been supporting me through not only my swims, but the very dark moments we have both had to endure – through no fault of our own. Without all of you and your never-ending support I would be nowhere. Well people, its almost time for the big one…I will be doing Loch Lomond this month, My company – Altered Images – have come onboard to help with this event and they have chosen a charity called Shooting stars. A children’s hospice charity caring for babies, children and young people with life-limiting conditions, and their families. Please spare any change for these phenomenal people.